What happens when a Muslim womam marry/wants to marry a non-Muslims man (read Hindu here). Two possibilities are there – either the Hindu man is killed or else the Muslim woman is killed. In NO case they can marry. So when a Muslim man marry a Hindu girl it’s all about “Communal harmony”, “Peace within Society” or “National Integration” or in the least case it is about “Love”. But when the direction of the “Love” changes all Hell broke. Here is my advice to all those stupid non-Muslims girls who are having affair with Muslim guys. Save your life and run from them – or else you will end up like this innocent “White-kaffir” girl who was killed by her Muslim lover. If you ever want to know why Muslims behave in a peculiar way, just read Quran. Muslims try to find the answer of every question in Quran instead of using their brains because they believe that Quran is the perfect book and Islam is the perfect religion – so why to use your brain. So when it comes to ‘why Muslims treat their women like their property?’ the answer is in Quran. Here is a report that tells how Islam’s identification of women as slave-to-men has degenerated their position. Moreover the muslim women are not allowed to think or take decisions and have to oblige by whatever their husbands want to. Here above you can see the happy Fogel family. 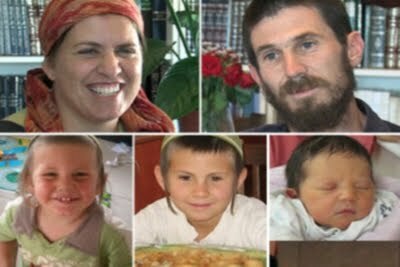 Udi Fogel(age 36, top-right), Ruth Fogel(age 35, top-left) and their children Elad(4), Yoav(11), and three-month-old daughter Hadas. On the night of 11 March Palestinian Muslims murdered all these innocent people – their crime – They were Jews. Their existaence was a threst to “The Religion of Peace” and it’s Holy Warriors. Digvijay Singh, the loud mouthed pseudo-secular idiot has now retracted from his earlier statement calling Osama bin Laden as “Osamaji”. Now he is saying that ‘Osamaji’ comment was a media creation-what a fraud. “Absolutely yes, thanks to media. What I can do when the media did not understand my sarcasm regarding Osama found near the Pakistan military academy?” Singh told reporters seeking to put the record straight on his remarks at a public meeting at Varanasi. Congress leader Digvijay Singh addresses Osama bin Laden as ‘Osamaji’. He welcomes the action taken by the US against him but questions Pakistan why they were not aware of the fact that he was staying very near to the military camp.